CONFIRMED! Golden Keys is a Haver, Nunn and Jensen design, in collaboration with Chopas and Starkovich. 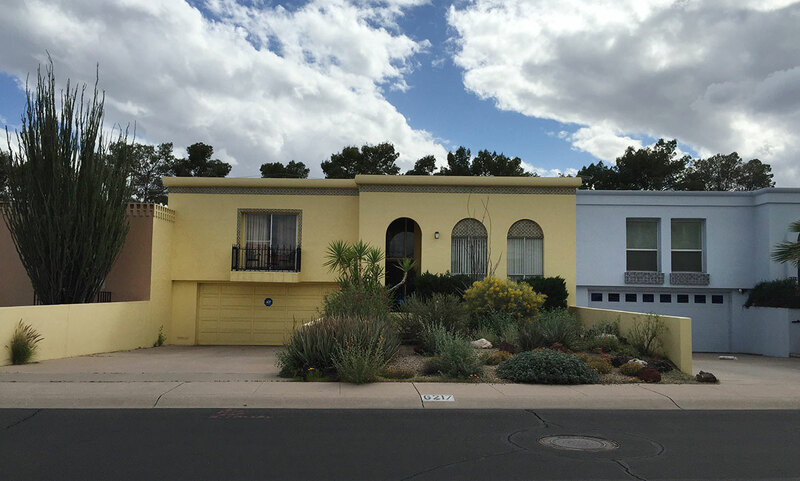 Responding to market demand, Dell Trailor and Ralph Haver developed a very good relationship in the early mid-60s centered around "Gold Key Homes". We believe that Golden Keys is where that relationship may have started. The Golden Keys 1 subdivision is listed under the year 1964 in the Haver portfolios, and it seems to have taken several years to build out in phases. 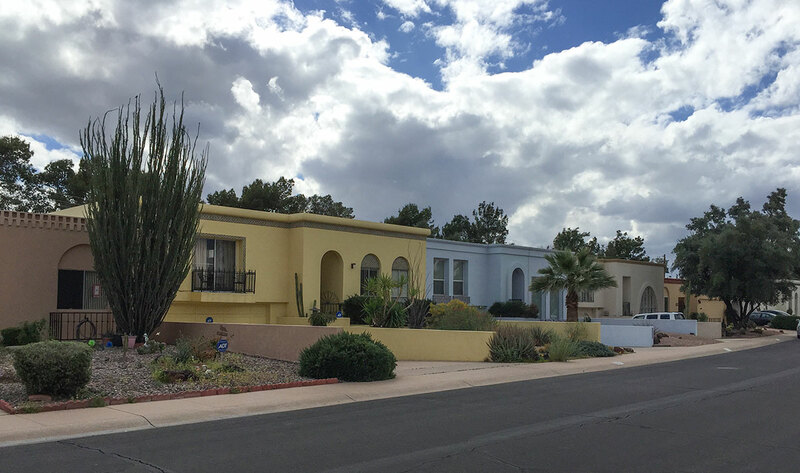 Several other Golden Keys developments in Mesa, Moon Valley and West Phoenix also feature similar characteristics but not the same amount of midcentury style. The neighborhood has architectural character comparable to Beekman Place and Sutton Place, both Dell Trailor developments of the mid-60s period and also confirmed as Haver designs. Golden Keys 1 could have been Haver's prototype for the style of townhome echoed at Sutton Place, shown below in this vintage ad for Warner's interior decoration services. Are the townhomes modern? Postmodern? 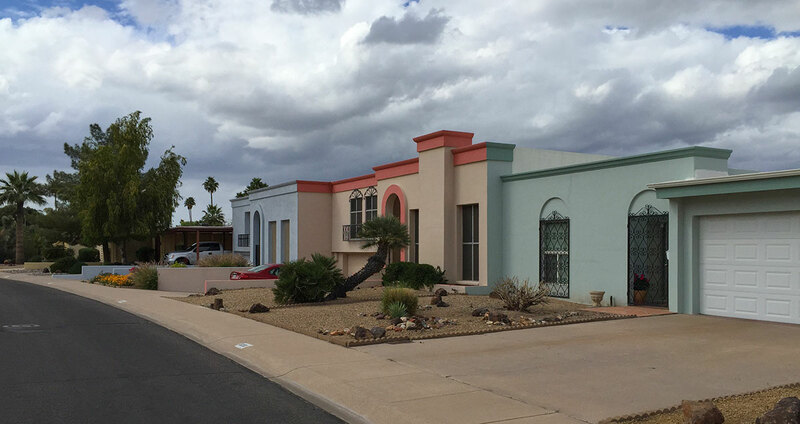 The mid-60s were a real turning point in aesthetics in architecture in Arizona. 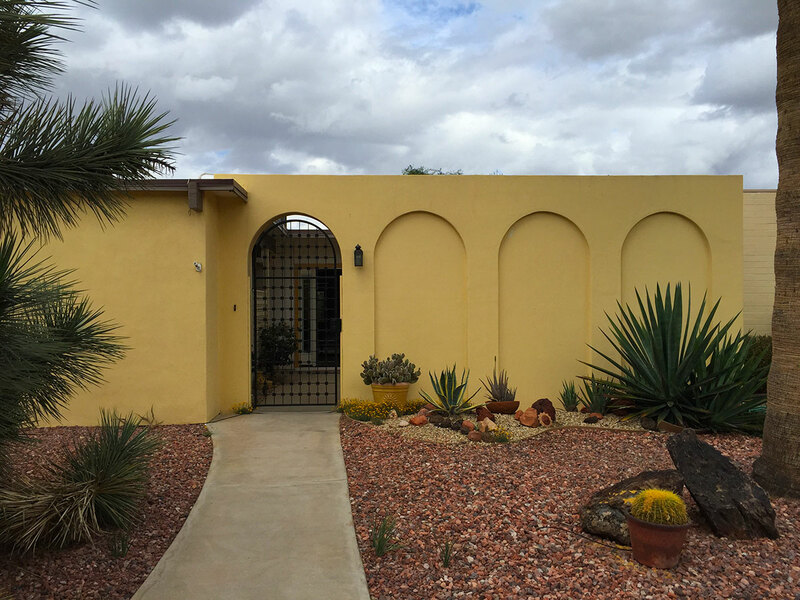 One oral history recounts that Dell Trailor had recently returned from a trip to the Mediterranean, and suggested this regional style to his architect for Golden Keys. Reference to styles of the past through reinterpretation instead of replication is one key trait of Postmodernism. The running bond of Superlite style block in the entryway and used as a frieze motif on some townhomes is reminiscent of a European aqueduct or classical Greek arcades. 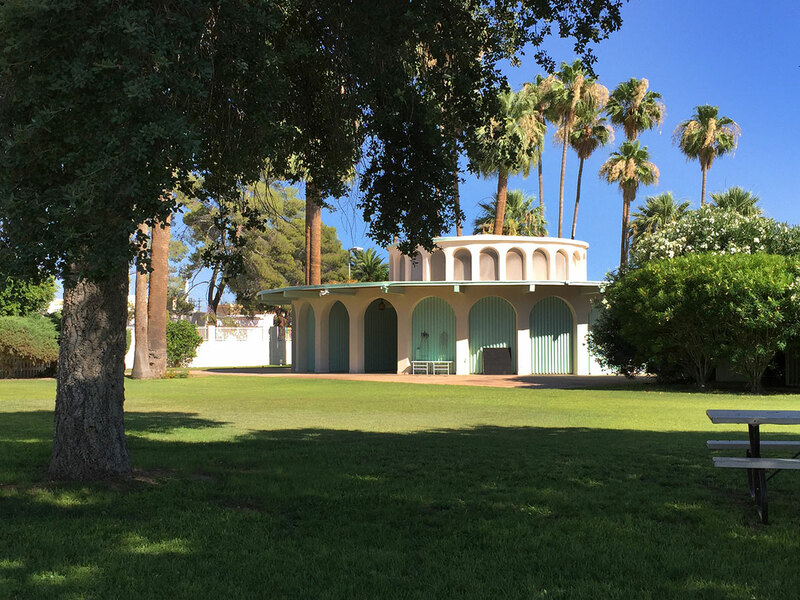 The lighting and entire entryway was likely designed by James Salter AIA as Jimmie Nunn reported that Salter designed the entryways and light fixtures for Dell Trailor developments. They are certainly in keeping with Salter's style. 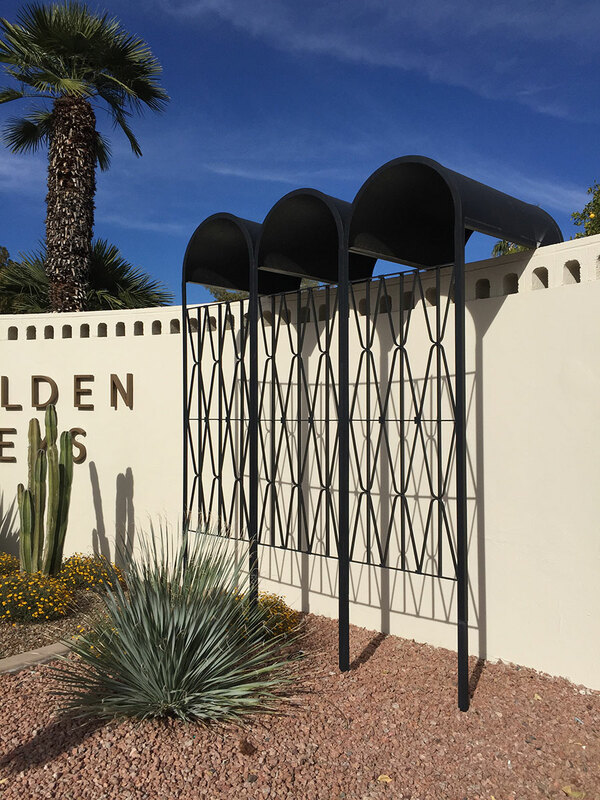 We know of no other development in Phoenix or Scottsdale that echo this unique formed steel feature. It very well may be one of a kind. Salter specialized in designing such metal work. Let us know if you find another example that is comparable! 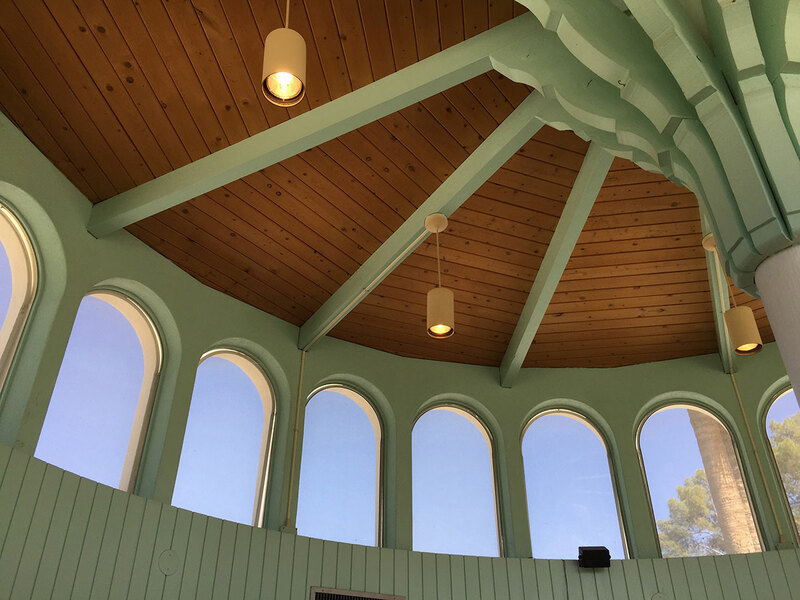 The pool house at Golden Keys features a Neo-Neoclassical colonnade that was favored by Haver's firm in the 1960s in everything from Barrow's Furniture stores and the Phoenix Municipal Complex to the Ciné Capri theater. In architecture history there is Classicism, Neoclassicism, and what we've started to call Neo-Neoclassicism for lack of a better term. The 1960s experienced another revival of a stripped down and gleaming white arcades or columns (often raw concrete) that echoed classical Greek and Roman forms. Historians might categorize this style as early Postmodernism for its historical reference and reinterpretation of classical forms — yet the forms are more geometric, smoother, and far from fussy. Recent evidence has surfaced that Chopas and Starkovich's firm drew up the plans for the poolhouse. 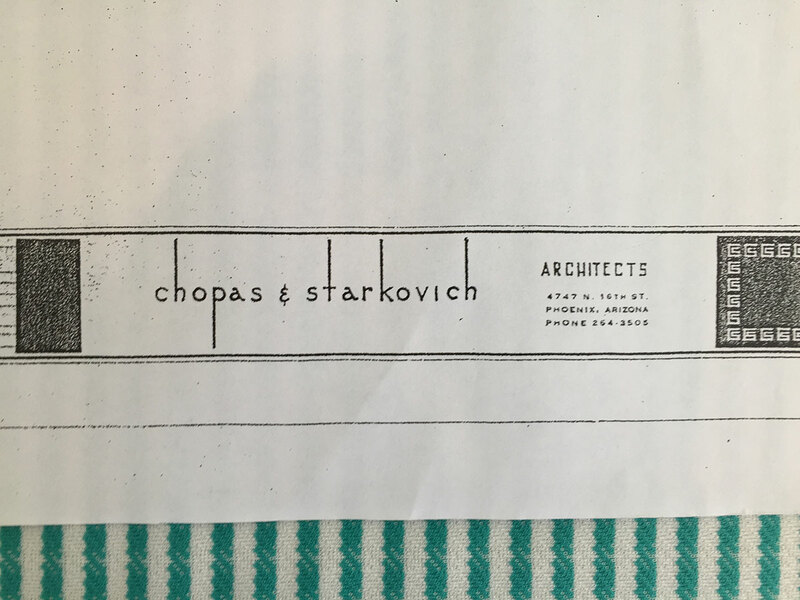 We know the two firms were amicable in the 60s, that Starkovich worked for Haver at one point, and his firm with Chopas was housed at 4747 (a contemporary Haver and Nunn designed office building now demolished) at 16th Street and Highland. It is possible that Haver's firm designed the master plan and vision, then Chopas and Starkovich actually executed it. Either way, the poolhouse appears in early marketing renderings of the complex in a similar form as it does today. 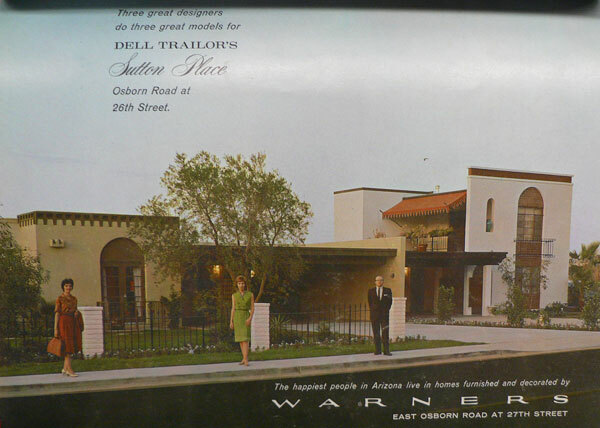 Dell Trailor took out a very expensive advertising insert in the Arizona Republic, the centerfold of which is reproduced in part above, to announce the grand opening and support his contractors' craftsmanship. We are told that the beams used to extend beyond the eaves much more than they do now, and they have since been sawed off. The arcade motif is expressed in the poolhouse, often on the townhomes themselves, and inside the townhomes as well. 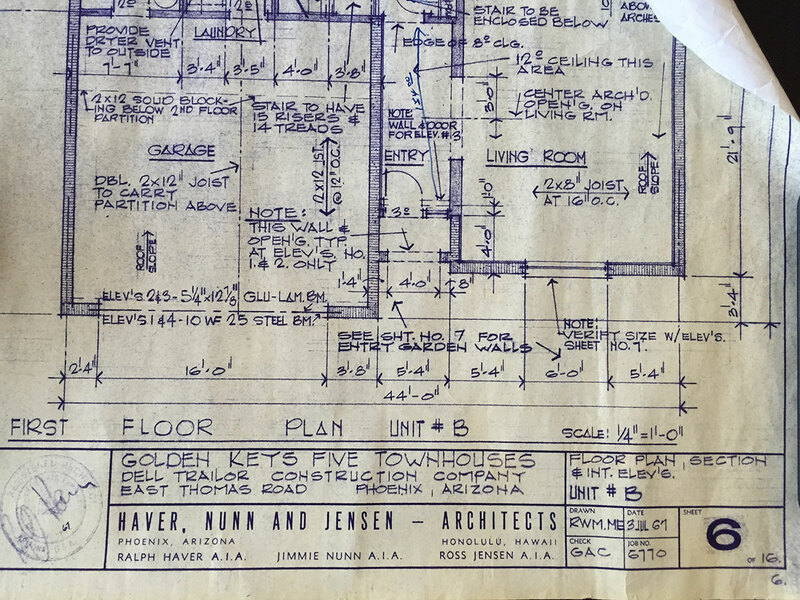 We're speculating that this sheet for Golden Keys 5 was drawn by RWM aka Bob Mrozinski and checked by GAC aka George A. Collamer. The year is 1967, helping to place a pin in the rate of growth at the Eastern end of the complex, and sealing the suspicion that Haver's firms was behind it. The streets still benefit from Haver's typically thoughtful planning that packaged spatial regularity with stylistic variety. 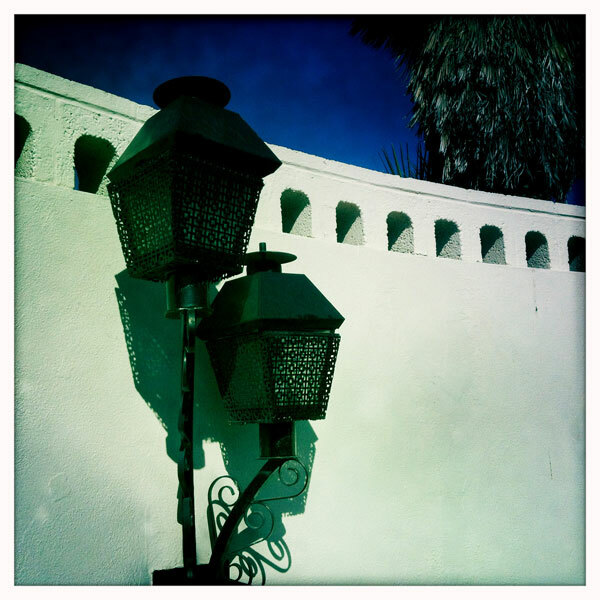 Homes are distinct from one another in character, form and color, yet maintain similar but not identical setbacks. Many of the split level homes feature a garage tucked beneath the lofty top floor. Almost all yards are xeriscaped for low maintenance. The poolhouse commons smartly serves as the community's green oasis. As the years progressed, the arcade cornice motif either fell out of favor or was later replaced with a flaring cornice. We are not sure at this time if this is an original transition or a remodeling motif gone viral throughout the community. 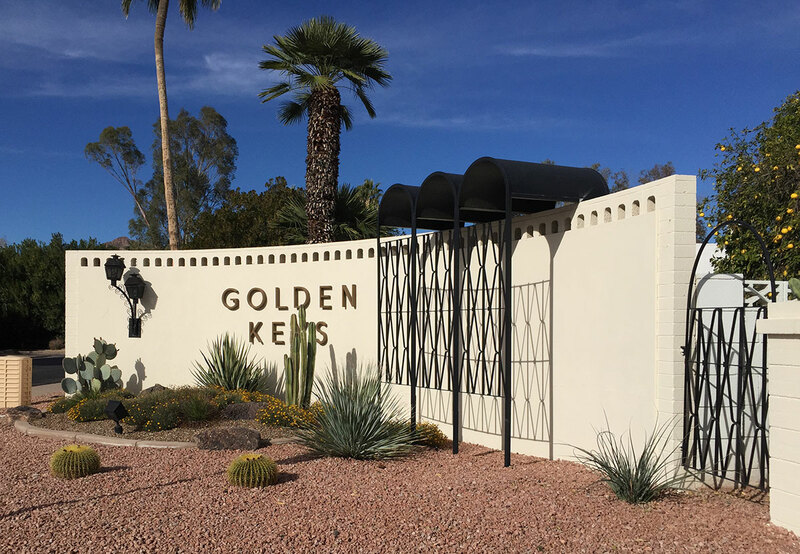 Golden Keys is an age-restricted community, and many on our 2015 Home Tour remarked how they could not wait to be mature enough to live at Golden Keys. When asked why, they reported its time-capsule quality facades and planning as a huge draw. 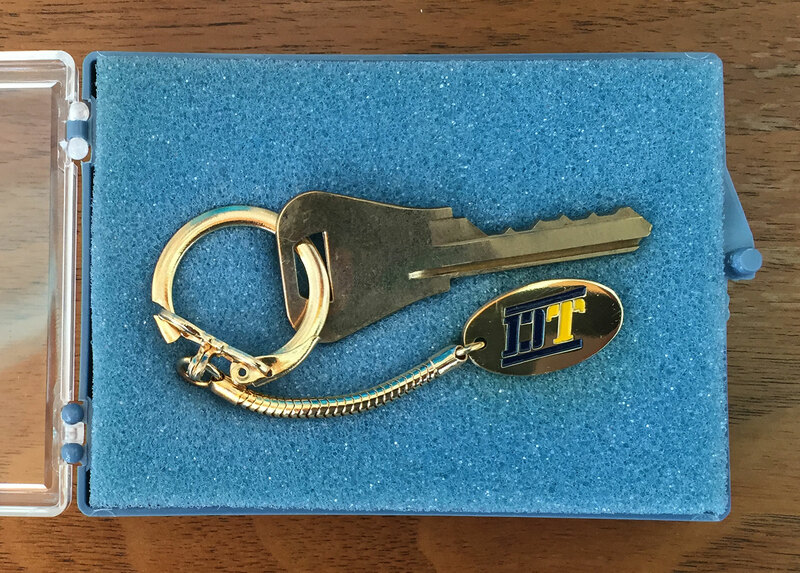 60s-era homeowners in Golden Keys received an actual Golden Key with a Dell Trailor keyfob attached. The Golden Key concept as a brand has been attributed to Trailor's fondness for his Cadillac car, possibly thinking that all deserved to own something as luxurious. 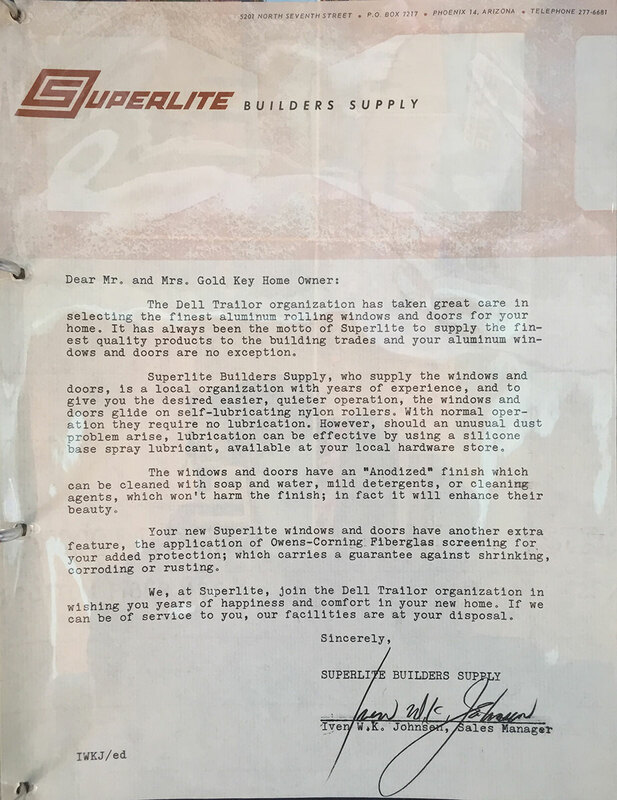 First-time buyers also received a welcome package with letters of congratulations and assurances of quality by the complex's contractors and service providers, like Superlite. The current HOA maintains a well-stocked binder that serves as an excellent primary source documenting many firms that were involved in the project. We applaud their historic committee for such careful gathering of documentation. 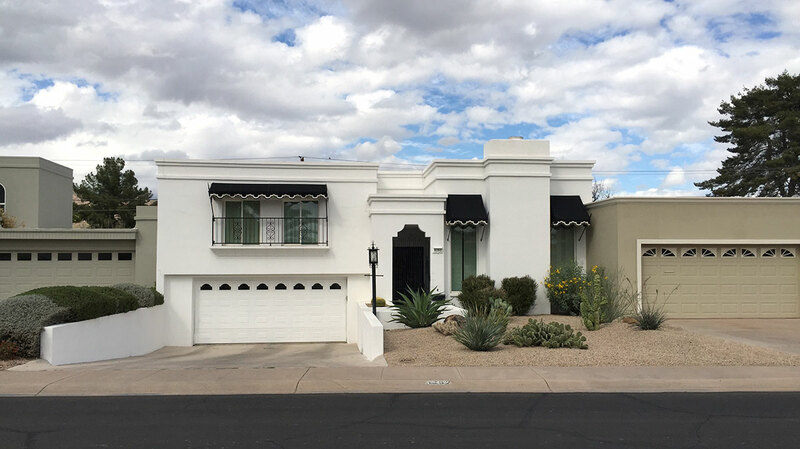 The City of Scottsdale approached Golden Keys to assess if they were interested in a historic preservation overlay, and ever since the issue has been hotly debated. 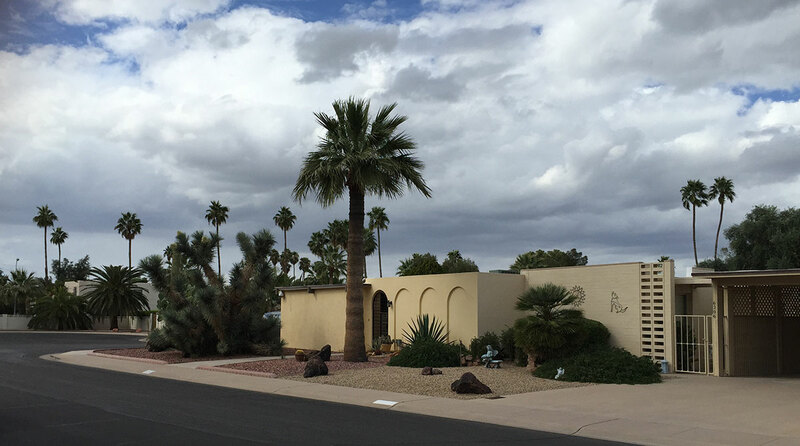 Modern Phoenix presented at a homeowner's association meeting in 2012 to outline the significance of the architecture and importance of preservation, but the invitation by Scottsdale remains unanswered other than that it will take more time to gain support for the nomination. 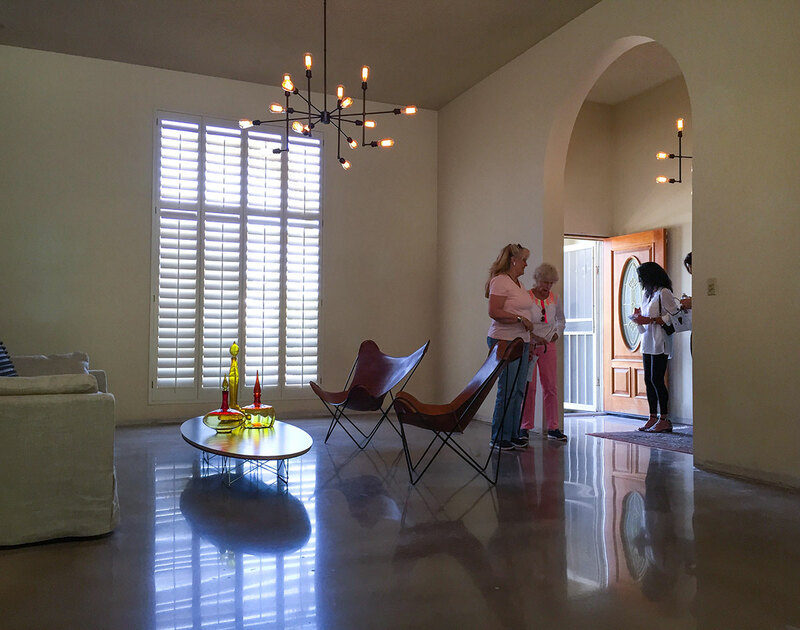 Since then, the complex was featured on the 2015 Modern Phoenix Home Tour, bringing much needed awareness to this Scottsdale treasure. 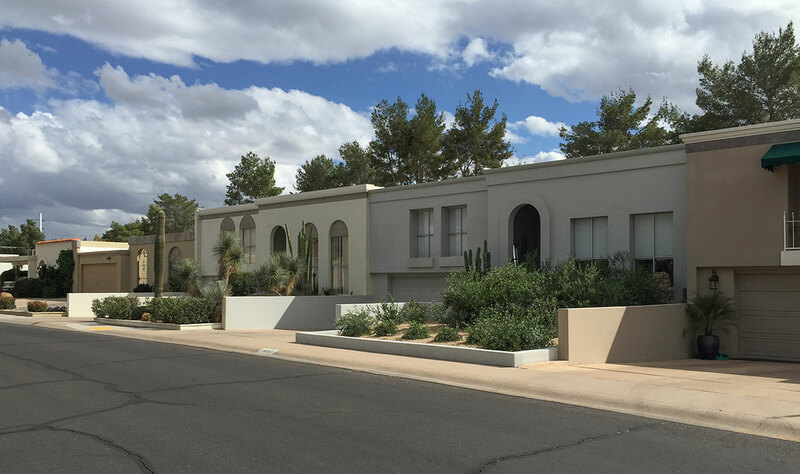 Golden Keys 1 is a fine example of affordable condominium living that reflects both the economic and aesthetic times of the mid 1960s when condo living was a radical new concept. 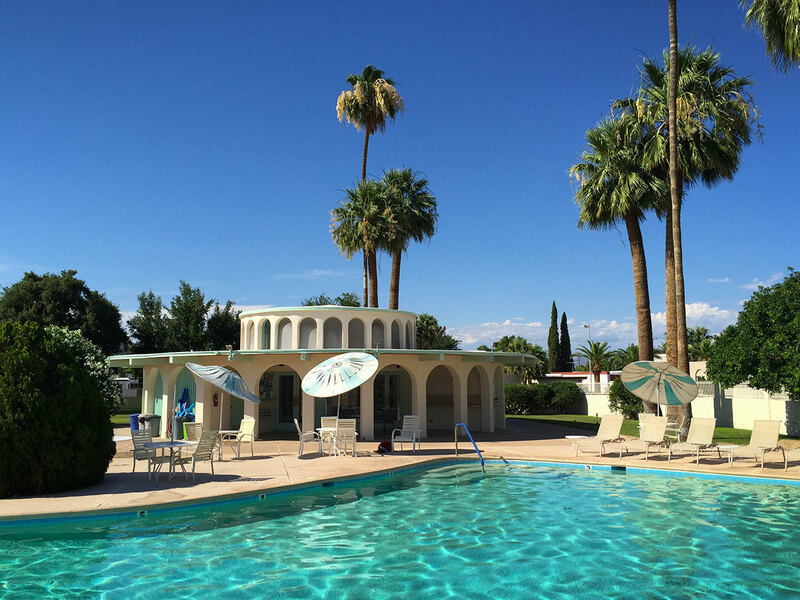 We believe that the complex could easily qualify for listing on the National Register of Historic Places as the work of an architectural master, and as an example of architecture reflecting lifestyle changes in American History. We urge Golden Keys residents to think beyond immediate concerns of individual expression and toward the future for the benefit of generations to come. Without historic preservation guidelines, subdivisions like Golden Keys could become riddled with historically inappropriate additions, materials and problems of scale. So many midcentury neighborhoods have slipped away from their original design program, but CC&Rs at Golden Keys help keep most external changes in check while allowing complete freedom on the interior. 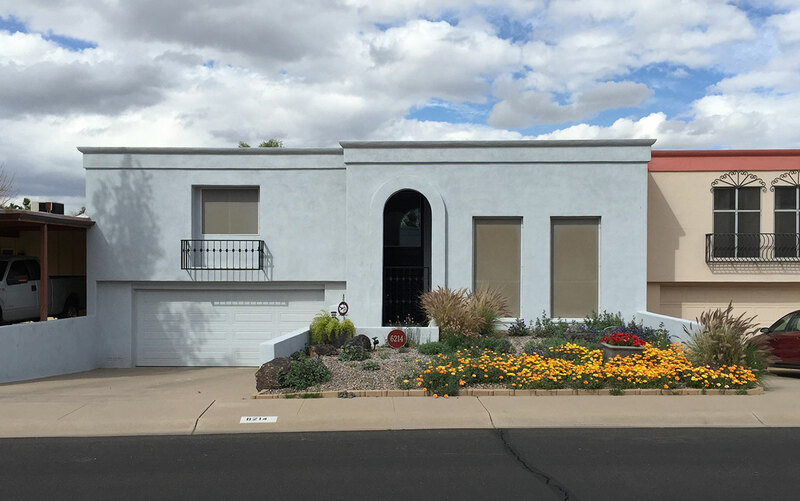 Through community action in 2003, The Sherwood Heights neighborhood convinced the Scottsdale City Council to restrict the height of home remodels, bringing them one step closer to qualifying for historic designation in the long term by deterring teardowns and McMansion scale remodels. 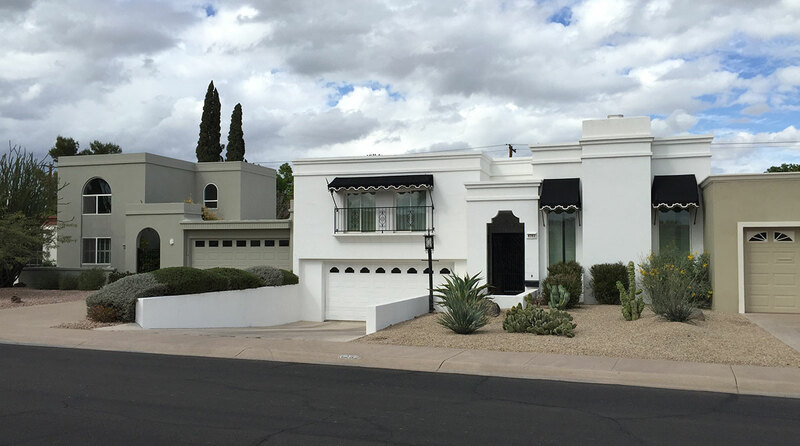 While some may call a Conservation District zoning ordinance or the 2003 Sherwood Heights PRD overlay "preservation lite" it is incremental character-preserving actions like this that could help maintain neighborhood character and stave off rapid development as longer term considerations are made in many of Phoenix's emerging historic modern neighborhoods. If your neighborhood isn't ready for Historic Preservation yet but you're worried about development, ask your local HP officer about a PRD or Conservation District.